(Greek Hoi Makkabaioi; Latin Machabei; most probably from Aramaic maqqaba="hammer"). A priestly family which under the leadership of Mathathias initiated the revolt against the tyranny of Antiochus IV Epiphanes, King of Syria, and after securing Jewish independence ruled the commonwealth till overthrown by Herod the Great. The name Machabee was originally the surname of Judas, the third son of Mathathias, but was later extended to all the descendants of Mathathias, and even to all who took part in the rebellion. It is also given to the martyrs mentioned in II Mach., vi, 18-vii. Of the various explanations of the word the one given above is the most probable. Machabee would accordingly mean "hammerer" or "hammer-like", and would have been given to Judas because of his valour in combating the enemies of Israel. The family patronymic of the Machabees was Hasmoneans or Asmoneans, from Hashmon, Gr. Asamonaios, an ancestor of Mathathias. This designation, which is always used by the old Jewish writers, is now commonly applied to the princes of the dynasty founded by Simon, the last of the sons of Mathathias. The rising under Mathathias was caused by the attempt of Antiochus IV to force Greek paganism on his Jewish subjects. This was the climax of a movement to hellenize the Jews, begun with the king's approval by a party among the Jewish aristocracy, who were in favour of breaking down the wall of separation between Jew and Gentile and of adopting Greek customs. The leader of this party was Jesus, or Josue, better known by his Greek name Jason, the unworthy brother of the worthy high-priest, Onias III. By promising the king a large sum of money, and by offering to become the promoter among the Jews of his policy of hellenizing the non-Greek population of his domains, he obtained the deposition of his brother and his own appointment to the high-priesthood (174 B.C.). As soon as he was installed he began the work of hellenizing and carried it on with considerable success. A gymnasium was built below the Acra (citadel), in close proximity to the temple, where the youths of Jerusalem were taught Greek sports. Even priests became addicted to the games and neglected the altar for the gymnasium. Many, ashamed of what a true Jew gloried in, had the marks of circumcision removed to avoid being recognized as Jews in the baths or the gymnasium. Jason himself went so far as to send money for the games celebrated at Tyre in honour of Hercules (1 Maccabees 1:11-16; 2 Maccabees 4:7-20). After three years, Jason was forced to yield the pontificate to Menelaus, his agent with the king in money matters, who secured the office by outbidding his employer. To satisfy his obligations to the king, the man, who was a Jew only in name, appropriated sacred vessels, and when the former high-priest Onias protested against the sacrilege he procured his assassination. The following year Jason, emboldened by a rumor of the death of Antiochus, who was then warring against Egypt, attacked Jerusalem and forced Menelaus to take refuge in the Acra. On hearing of the occurrence Antiochus marched against the city, massacred many of the inhabitants, and carried off what sacred vessels were left (1 Maccabees 1:17-28; 2 Maccabees 4:23-5:23). In 168 B.C. Antiochus undertook a second campaign against Egypt, but was stopped in his victorious progress by an ultimatum of the Roman Senate. He vented his rage on the Jews, and began a war of extermination against their religion. Apollonius was sent with orders to hellenize Jerusalem by extirpating the native population and by peopling the city with strangers. The persecution proved a blessing in disguise; it exasperated even the moderate Hellenists, and prepared a rebellion which freed the country from the corrupting influences of the extreme Hellenist party. The standard of revolt was raised by Mathathias, as priest of the order of Joarib (cf. 1 Chronicles 24:7), who to avoid the persecution had fled from Jerusalem to Modin (now El Mediyeh), near Lydda, with his five sons John, Simon, Judas, Eleazar and Jonathan. When solicited by a royal officer to sacrifice to the gods, with promises of rich rewards and of the king's favour, he firmly refused, and when a Jew approached the altar to sacrifice, he slew him together with the king's officer, and destroyed the altar. He and his sons then fled to the mountains, where they were followed by many of those who remained attached to their religion. Among these were the Hasîdîm, or Assideans, a society formed to oppose the encroaching Hellenism by a scrupulous observance of traditional customs. Mathathias and his followers now overran the country destroying heathen altars, circumcising children, driving off aliens and apostate Jews, and gathering in new recruits. He died, however, within a year (166 B.C.). At his death he exhorted his sons to carry on the fight for their religion, and appointed Judas military commander with Simon as adviser. He was buried at Modin amid great lamentations (1 Maccabees 2). Judas fully justified his father's choice. In a first encounter he defeated and killed Apollonius, and shortly after routed Seron at Bethoron (1 Maccabees 3:1-26). Lysias, the regent during Antiochus's absence in the East, then sent a large army under the three generals Ptolemee, Nicanor and Gorgias. Judas's little army unexpectedly fell on the main body of the enemy at Emmaus (later Nicopolis, now Amwâs) in the absence of Gorgias, and put it to rout before the latter could come to its aid; whereupon Gorgias took to flight (1 Maccabees 3:27-4:25; 2 Maccabees 8). The next year Lysias himself took the field with a still larger force; but he, too, was defeated at Bethsura (not Bethoron as in the Vulgate). Judas now occupied Jerusalem, though the Acra still remained in the hands of the Syrians. The temple was cleansed and rededicated on the day on which three years before it had been profaned (1 Maccabees 4:28-61; 2 Maccabees 10:1-8). During the breathing time left to him by the Syrians Judas undertook several expeditions into neighbouring territory, either to punish acts of aggression or to bring into Judea Jews exposed to danger among hostile populations (1 Maccabees 5; 2 Maccabees 10:14-38; 12:3-40). After the death of Antiochus Epiphanes (164 B.C.) Lysias led two more expeditions into Judea. The first ended with another defeat at Bethsura, and with the granting of freedom of worship to the Jews (2 Maccabees 11). In the second, in which Lysias was accompanied by his ward, Antiochus V Eupator, Judas suffered a reverse at Bethzacharam (where Eleazar died a glorious death); and Lysias laid siege to Jerusalem. Just then troubles concerning the regency required his presence at home; he therefore concluded peace on condition that the city be surrendered (1 Maccabees 6:21-63; 2 Maccabees 13). As the object for which the rebellion was begun had been obtained, the Assideans seceded from Judas when Demetrius I, who in the meanwhile had dethroned Antiochus V, installed Alcimus, "a priest of the seed of Aaron", as high-priest (1 Maccabees 7:1-19). Judas, however, seeing that the danger to religion would remain as long as the Hellenists were in power, would not lay down his arms till the country was freed of these men. Nicanor was sent to the aid of Alcimus, but was twice defeated and lost his life in the second encounter (1 Maccabees 7:20-49; 2 Maccabees 14:11-15:37). Judas now sent a deputation to Rome to solicit Roman interference; but before the senate's warning reached Demetrius, Judas with only 800 men risked a battle at Laisa (or Elasa) with a vastly superior force under Baccides, and fell overwhelmed by numbers (1 Maccabees 8-9:20). Thus perished a man worthy of Israel's most heroic days. He was buried beside his father at Modin (161 B.C.). The handful of men who still remained faithful to Judas's policy chose Jonathan as their leader. John was soon after killed by Arabs near Madaba, and Jonathan with his little army escaped the hands of Bacchides only by swimming the Jordan. Their cause seemed hopeless. Gradually, however, the number of adherents increased and the Hellenists were again obliged to call for help. Bacchides returned and besieged the rebels in Bethbessen; but disgusted at his ill success he returned to Syria (1 Maccabees 9:23-72). During the next four years Jonathan was practically the master of the country. Then began a series of contests for the Syrian crown, which Jonathan turned to such good account that by shrewd diplomacy he obtained more than his brother had been able to win by his generalship and his victories. Both Demetrius I and his opponent Alexander Balas, sought to win him to their side. Jonathan took the part of Alexander, who appointed him high-priest and bestowed on him the insignia of a prince. Three years later, in reward for his services, Alexander conferred on him both the civil and military authority over Judea (1 Maccabees 9:73-10:66). In the conflict between Alexander and Demetrius II Jonathan again supported Alexander, and in return received the gift of the city of Accaron with its territory (1 Maccabees 10:67-89). After the fall of Alexander, Demetrius summoned Jonathan to Ptolemais to answer for his attack on the Acra; but instead of punishing him Demetrius confirmed him in all his dignities, and even granted him three districts of Samaria. Jonathan having lent efficient aid in quelling an insurrection at Antioch, Demetrius promised to withdraw the Syrian garrison from the Acra and other fortified places in Judea. As he failed to keep his word, Jonathan went over to the party of Antiochus VI, the son of Alexander Balas, whose claims Tryphon was pressing. Jonathan was confirmed in all his possessions and dignities, and Simon appointed commander of the seaboard. While giving valuable aid to Antiochus the two brothers took occasion to strengthen their own position. Tryphon fearing that Jonathan might interfere with his ambitious plans treacherously invited him to Ptolemais and kept him a prisoner (1 Maccabees 11:19-12:48). Simon was chosen to take the place of his captive brother, and by his vigilance frustrated Tryphon's attempt to invade Judea. Tryphon in revenge killed Jonathan with his two sons whom Simon had sent as hostages on Tryphon's promise to liberate Jonathan (1 Maccabees 13:1-23). Simon obtained from Demetrius II exemption from taxation and thereby established the independence of Judea. To secure communication with the port of Joppe, which he had occupied immediately upon his appointment, he seized Gazara (the ancient Gazer or Gezer) and settled it with Jews. He also finally drove the Syrian garrison out of the Acra. In recognition of his services the people decreed that the high- priesthood and the supreme command, civil and military, should be hereditary in his family. After five years of peace and prosperity under his wise rule Judea was threatened by Antiochus VII Sidetes, but his general Cendebeus was defeated at Modin by Judas and John, Simon's sons. A few months later Simon was murdered with two of his sons by his ambitious son-in-law Ptolemy (D.V. Ptolemee), and was buried at Modin with his parents and brothers, over whose tombs he had erected a magnificent monument (1 Maccabees 13:25-16:17). After him the race quickly degenerated. Simon's third son, John, surnamed Hyrcanus, who escaped the assassin's knife through timely warning, was recognized as high-priest and chief of the nation. In the first year of his rule Antiochus Sidetes besieged Jerusalem, and John was forced to capitulate though under rather favourable conditions. Renewed civil strife in Syria enabled John to enlarge his possessions by the conquest of Samaria, Idumea, and some territory beyond the Jordan. By forcing the Idumeans to accept circumcision, he unwittingly opened the way for Herod's accession to the throne. In his reign we first meet with the two parties of the Pharisees and Sadducees. Towards the end of his life John allied himself with the latter. Alexander bequeathed the government to his wife Alexandra Salome, and the high-priesthood to his son Hyrcanus II. She ruled in accordance with the wishes of the Pharisees. At her death (69 B.C.) civil war broke out between Hyrcanus II and his brother Aristobulus II. This brought on Roman interference and loss of independence (63 B.C.). Hyrcanus, whom the Romans recognized as ethnarch, was ruler only in name. 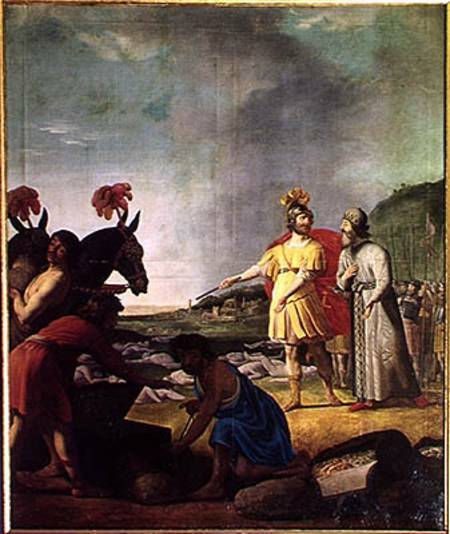 Aristobulus was poisoned in Rome by the adherents of Pompey, and his son Alexander was beheaded at Antioch by order of Pompey himself (49 B.C.). Antigonus, the son of Aristobulus, was made king by the Parthians; but the next year he was defeated by Herod with the aid of the Romans, and beheaded at Antioch (37 B.C.). With him ended the rule of the Machabees. Herod successively murdered (a) Aristobulus III, the grandson of both Aristobulus II and Hyrcanus II through the marriage of Alexander, the son of the former, with Alexandra, the daughter of the latter (35 B.C. ); (b) Hyrcanus II (30 B.C.) and his daughter Alexandra (28 B.C. ); (c) Mariamne, the sister of Aristobulus III (29 B.C. ); and lastly his own two sons by Mariamne, Alexander and Aristobulus (7 B.C.). In this manner the line of the Machabees became extinct. WELLHAUSEN, Israelitische und Jüdische Geschichte (Berlin, 1894); CURTISS, The Name Machabees (Leipzig, 1876). Judas Maccabaeus (HWV 63) is an oratorio in three acts composed in 1746 by George Frideric Handel based on a libretto written by Thomas Morell. Morell's libretto is based on the deuterocanonical or apocryphal book 1 Maccabees (2–8), with motives added from the Antiquitates Judaicae by Flavius Josephus. The events depicted in the oratorio are from the period 170–160 BC when Judea was ruled by the Seleucid Empire which undertook to destroy the Jewish religion. Being ordered to worship Zeus, many Jews obeyed under the threat of persecution; however, some did not. One who defied was the elderly priest Mattathias who killed a fellow Jew who was about to offer a pagan sacrifice. After tearing down a pagan altar, Mattathias retreated to the hills and gathered others who were willing to fight for their faith. Handel's music depicts the changing moods of the Jewish people as their fortunes vary from dejection to jubilation. The people mourn the death of their leader Mattathias, but his son Simon tries to restore their faith and calls them to arms (Arm, arm, ye brave). Simon's brother, Judas Maccabaeus, assumes the role of leader and inspires the people with thoughts of liberty and victory through the power of Jehovah. The people have been victorious, but Judas is concerned that vanity will cause the people to claim victory for themselves. When news arrives that the Seleucid commander Gorgias is preparing to enact revenge, the people's joyous mood gives way to wailing and dejection (Ah! wretched Israel!). Again Judas rallies the people (Sound an alarm) and insists that the pagan altars must be destroyed and that false religions must be resisted.